Many people still believe the first set of teeth that children have really don’t matter because they’ll eventually fall out some day and be replaced by more permanent ones. Well, that someday may be further in the future than you think! Notice, that there can be quite a few years before the permanent (adult) teeth are expected to show up in the mouth. That’s quite a few years to leave a cavity untreated or lose a tooth too early. Learning how to properly care for the first set of teeth will help teach your child to continue that care into adulthood. Speech development – The tongue, lips and cheeks deflect off teeth when forming sounds. 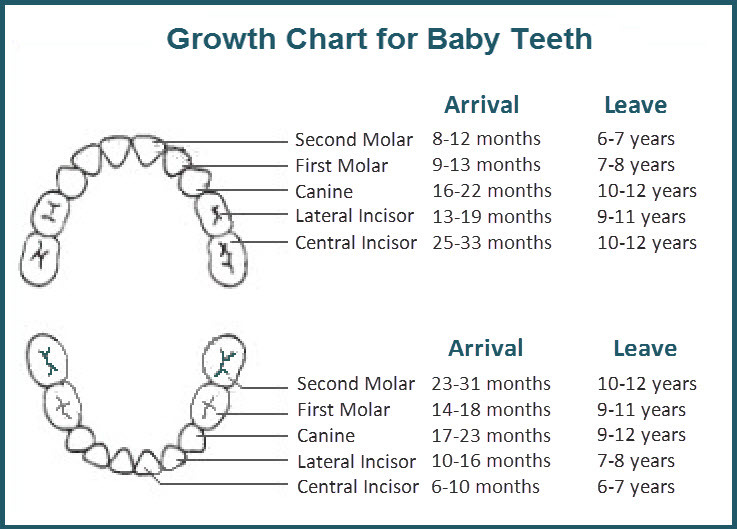 The presence and proper positioning of baby teeth assist in the formation of correct pronunciation during speech. Facial development – Teeth provide structural support for the developing facial muscles and give shape to your child’s face. Proper chewing – Of course, teeth are needed for chewing and maintaining proper nutrition is essential for healthy development. Eating is compromised when teeth are missing or painful. Building self-esteem – Although children do go through a stage when teeth are coming and going that can sometimes leave a smile looking a little awkward, this is a natural period during childhood and is usually being experienced by a number of other children they know. Unhealthy, decayed teeth however, can interfere with a child’s social interactions and affect their self-esteem. Concentration – Painful teeth can affect the way a child is able to pay attention and learn in school. There’s enough distractions at school already without dental pain complicating matters further. Proper permanent teeth positioning – The primary teeth save the space for the adult teeth and guide them into their normal position. If a tooth is lost too early the adjacent teeth tend to tip into the space leaving less room for the emerging permanent tooth. Healthy permanent teeth – A child’s next set of teeth develop very close to the roots of the baby teeth. These primary teeth are much smaller and cavities can spread very quickly through their thinner enamel. If left untreated, a baby tooth can develop an infection which can affect the permanent teeth forming underneath them. Future oral care – These first teeth are somewhat like “practice teeth.” Teaching your child to develop good oral care habits with their primary teeth will help ensure that they understand the importance of healthy teeth so they can keep their next set for life! If a primary tooth does need to be removed before it’s natural time, your dentist will most likely recommend placing a space maintaining device into the area. This spacer will keep the other teeth from drifting into this vacant area causing crowding and orthodontic problems for the adult teeth. A healthy mouth is important to your child’s whole health. We have seen first hand how healthy attitudes learned as a child contribute to positive and long lasting adult habits and perceptions. The patients in our practice who had regular check-ups and early interventions as children tend to maintain healthy mouths, have much fewer dental issues and possess very responsible attitudes towards their oral health care status as adults. As our children’s primary role models, we parents, have more influence over our children than anyone else. Studies have shown that they are more likely to pattern their future choices and beliefs after ours and maintain the habits they learn as children throughout their lives. Your child’s best chance at keeping their teeth for life is to witness first hand your positive attitudes towards your teeth and going to the dentist. Your positive remarks and optimistic outlook about dental care will empower your children and help to ensure that they will continue to benefit from your great example! These “first teeth” are necessary for a child to chew and speak. But baby teeth serve another very important purpose–they save space for the child’s future permanent teeth. Yes, they certainly do!. As mentioned above, the primary teeth save the space for the adult teeth and guide them into their normal position. And, if teeth are out of alignment and need correction, your specialty is there to step in and help straighten thing out! Thank you for being there to provide this service. Thanks for sharing this article, Dr. Axelrod! We recently had a baby, so I’m trying to make sure that I’m ensuring her safety and health. I’ve read elsewhere that developing early habits with the baby increases the probability that they’ll maintain autonomous dental health. The source recommended that I wash the baby’s mouth—even if they haven’t developed teeth yet—with a wash rag. Do you know if that’s something that I should be doing? Certainly! All it takes is a quick swipe of the gums with a soft, wet gauze or wash cloth. The idea is to initially promote an sense of familiarity of having you clean their mouth and attending to this small, confined space so that when the teeth do emerge they are already open to the idea of oral hygiene. Additionally, you will also get used to this task and become familiar with the normal appearance of gum tissue so that when their new teeth do start to appear you will likely notice a change in colour/appearance of the gums sooner. I have heard from many parents that waited for their child to be older before they introduced the idea of tooth brushing that this routine became a challenging and frustrating task for both parent and child. Helping children understand the importance of caring for their bodies early on in life will ideally help them to develop healthy, life long habits. Happy Parenting! I really like what you said about speech development. When I was little I knocked my two front teeth out because I wanted money from the tooth fairy. This resulted in me getting a bad lisp, so I was really embarrassed and hated going to school. Thanks for taking time to write.